Christian Gather, Thomas Schmidt and Holger Barske - three editors at Klang+Ton entered a competition to find out who would build the best mini monitor. The result was published in Klang+Ton 6/2007, the kits are available from us. 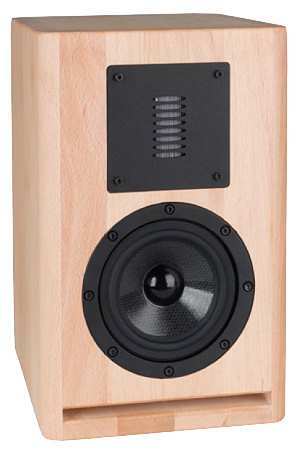 The three loudspeakers were then named after the initials of the originators. Christian Gather and Udo Wohlgemuth based their design on the Minuetta, the crossover was, however, heavily modified. Like in the Minuetta, the Air Motion Transformer Eton ER4 - with a small, dampened chamber - and the Eton 5-880/25 HEX mid / bass driver were employed. ... "My Mini CG was first in the row and immediately displayed the magic of the Eton drivers: precision and perfect balance. Well, that was to be expected, I had chosen the Eton drivers for a good reason. Connecting the Mini TS Scan Speak drivers revealed some interesting results. The sound was also smooth and well balanced. . Due to a slightly more fluid and relaxed bass the TS even narrowly beats my CG. But I hit back with razor-sharp precision: the ER4 AMT places the plucking of guitar strings right in middle of the room. The Scandinavian equipped Mini HB counters with a slightly smoother, more fluid and more musical performance." ... "Also the ceramic diaphragms of the Thiel equipped Mini TS are quite capable of showing tremendous precision and came close to my CG, but was just a notch better in resolving details. On the other hand the TS scores with a pleasant, unspectacular and relaxed presentation resulting in even less listening fatigue. A wealth of information is reproduced almost hands down, with pleasant emotional balance. The TS also narrowly beats the CG with a slightly more solid bass, but shows some considerable limitations in power handling due to the soft suspension of the driver. The volume is certainly adequate for normal operation but due to the lack of a progressive suspension the driver excursion could become quite extreme, causing beads of sweat on the operator's forehead. But as long as the TS doesn't suffer the final blow this speaker shows without doubt the best all-round qualities and lands up between the extremely precise CG and the fluid and musical HB. " The kit is delivered without Mini napped foam MN10 because this is no longer available. So the Napped foam N25 has to be used. If you don't want to mount the crossover components on wood, we recommend a 220 x 155 mm universal PCB.